Imagine that you have gotten a low-priv Meterpreter session on a Windows machine. Probably you’ll run getsystem to escalate your privileges. But what if it fails? Don’t panic. There are still some techniques you can try. Basically, it is a vulnerability that occurs if a service executable path is not enclosed with quotation marks and contains space. C:\Users\testuser\Desktop>wmic service get name,displayname,pathname,startmode |findstr /i "Auto" |findstr /i /v "C:\Windows\\" |findstr /i /v """
This vulnerability is caused by the CreateProcess function in Windows operating systems. For more information click read this article. If we can drop our malicious exe successfully on one of these paths, upon a restart of the service, Windows will run our exe as SYSTEM. But we should have necessary privileges on one of these folders. C:\Program Files (x86)\Program Folder>icacls "C:\Program Files (x86)\Program Folder"
icacls "C:\Program Files (x86)\Program Folder"
What a luck! As you can see, “Everyone” has full control on this folder. CI = Container Inherit – This flag indicates that subordinate containers will inherit this ACE. OI = Object Inherit – This flag indicates that subordinate files will inherit the ACE. This means we are free to put any file to this folder! From now on, what you’re going to do depends on your imagination. I simply preferred to generate a reverse shell payload to run as SYSTEM. meterpreter > cd "../../../Program Files (x86)/Program Folder"
As you can see, our session has died. We’ll never forget you low-priv shell. RIP. Our target machine is restarting now. Soon, our payload will work as SYSTEM. We should start a handler right away. Now we have gotten a Meterpreter shell with SYSTEM privileges. High five! But wait, why did our session die so quickly? We just started! No need to worry. It’s because, when a service starts in Windows operating systems, it must communicate with the Service Control Manager. If it’s not, Service Control Manager thinks that something is not going well and terminates the process. C:\Program Files (x86)>mkdir "Program Folder\A Subfolder"
You know, Windows services run as SYSTEM. So, their folders, files, and registry keys must be protected with strong access controls. In some cases, we encounter services that are not sufficiently protected. In Windows, information related to services is stored in HKLM\SYSTEM\CurrentControlSet\Services registry key. If we want to see information about our “Vulnerable Service” we should check HKLM\SYSTEM\ControlSet001\Services\Vulnerable Service key. But the point is, how can we check these permissions from the command line? Let’s start the scenario from the beginning. You have gotten a low-priv Meterpreter session and you want to check permissions of a service. You can use SubInACL tool to check registry keys permissions. You can download it here but the point you need to be aware of it deployed as an msi file. 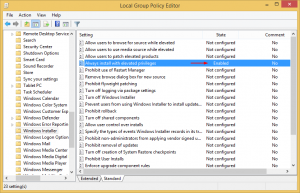 If AlwaysInstallElevated policy setting is not enabled on target machine you can’t install msi files with low-priv user. (We will discuss AlwaysInstallElevated policy later in this post) And of course, you may do not want to install a new software to the target machine. I recommend you to install it a virtual machine and find subinacl.exe file in C:\Program Files (x86)\Windows Resource Kits\Tools\. It will work smoothly without having to install msi package. Now SubInACL tool ready to use. Let’s check permissions for HKEY_LOCAL_MACHINE\SYSTEM\ControlSet001\Services\Vulnerable Service. Focus on 20th to 23rd lines. It says Everyone has Full Control on this registry key. It means we can change the executable path of this service by editing the ImagePath value. It’s a huge security weakness. If we generate a simple reverse shell payload and drop it to our target, all that remains is changing the ImagePath value for our vulnerable service with our payload’s path. Now let’s change the ImagePath value with our payload’s path. At the next start of the service, Payload.exe will run as SYSTEM. 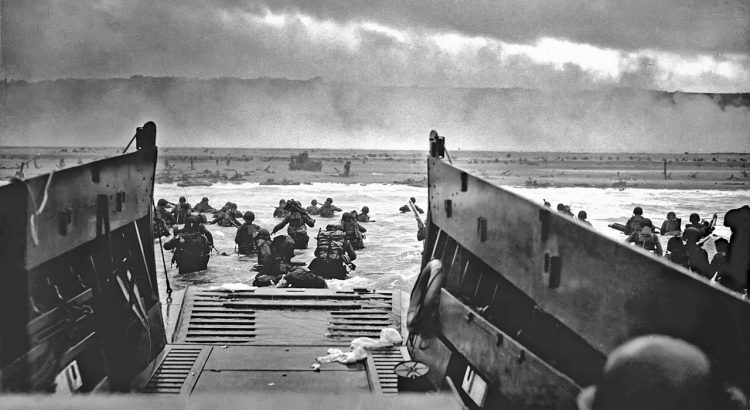 But remember, we had to restart the computer to do this. Our target machine is restarting now. Prepare your handler! Soon, our payload will work as SYSTEM. But don’t forget! We are working with services just as in the previous method our hi-priv meterpreter session will die quickly. It is very similar to previous Insecure Registry Permissions example. Instead of changing service’s “ImagePath” registry value directly we will do it with modifying service properties. To check which Services have vulnerable privileges we can use AccessChk tool from SysInternals Suite. All services that “testuser” can modify will be listed. SERVICE_ALL_ACCESS means we have full control over modifying the properties of Vulnerable Service. BINARY_PATH_NAME points to Executable.exe which is executable file for this service. If we change this value with any command means this command will run as SYSTEM at the next start of the service. We can add a local admin if we want. C:\Users\testuser\AppData\Local\Temp>sc config "Vulnerable Service" binpath= "net user eviladmin [email protected] /add"
sc config "Vulnerable Service" binpath= "net user eviladmin [email protected] /add"
When you try to start service it will return an error. As we talked earlier it’s because, when a service starts in Windows operating systems, it must communicate with the Service Control Manager. “net user” cannot communicate with the SCM. No worries, our command will run as SYSTEM and the new user will be added successfully. C:\Users\testuser\AppData\Local\Temp>sc config "Vulnerable Service" binpath="net localgroup Administrators eviladmin /add"
sc config "Vulnerable Service" binpath= "net localgroup Administrators eviladmin /add"
Enjoy your new local admin account! As we did before, you can prefer dropping a reverse shell payload to target machine and replacing binpath with the payload’s path. It is very similar to what we did with Unquoted Service Paths. Unquoted Service Paths takes advantage of “CreateProcess” function’s weakness in combination with folder permissions along the executable file path of a service. But here we will try to replace the executable directly. C:\Program Files (x86)\Program Folder>icacls "C:\Program Files (x86)\Program Folder\A Subfolder"
icacls "C:\Program Files (x86)\Program Folder\A Subfolder"
Simply replacing “Executable.exe” file with a reverse shell payload and restarting the service will give us a meterpreter session with SYSTEM privileges. AlwaysInstallElevated is a policy setting that directs Windows Installer to use elevated permissions when it installs any package on the system. If this policy setting is enabled, privileges are extended to all programs. If you got an error like “ERROR: The system was unable to find the specified registry key or value.” this means this registry values never created. So, the policy is not enabled. As I said before, in this situation, Windows Installer will use elevated permissions when it installs any package. So we should generate a malicious .msi package and run it. MSFvenom can handle this. But in this scenario, I’ll generate an executable reverse shell payload(Payload.exe) and an msi package(malicious.msi) that executes this payload. Let’s do it! Now we can upload these two to our target machine. Now we’re ready to execute! Enjoy your shell with SYSTEM privileges! This method only works on a Windows 2000, XP, or 2003 machine. You must have local administrator privileges to manage scheduled tasks. If you have a meterpreter session with limited user privileges this method will not work. Again, I’ll generate an executable reverse shell payload for this job. Let’s demonstrate! meterpreter > cd "C:/Documents and Settings/test/Local Settings/Temp"
C:\Documents and Settings\test\Local Settings\Temp>net start "Task Scheduler"
C:\Documents and Settings\test\Local Settings\Temp>at 06:42 /interactive "C:\Documents and Settings\test\Local Settings\Temp\Payload.exe"
at 06:42 /interactive "C:\Documents and Settings\test\Local Settings\Temp\Payload.exe"
Suppose that none of above methods worked. But of course, we did not give up. You may want to check running processes for DLL hijacking vulnerability. 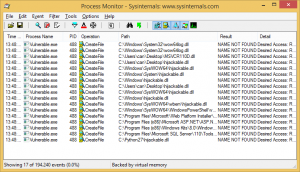 Check whether the DLL that process looking for exists in any directory on the disk. If it does not exist, place the malicious copy of DLL to one of the directories that I mentioned above. When process executed, it will find and load malicious DLL. If the DLL file already exists in any of these paths, try to place malicious DLL to a directory with a higher priority than the directory where the original DLL file exists. For example, if the original DLL exists in the C:\Windows directory and if we gain control of the directory which the application loaded and place a malicious copy of the DLL in that directory, when the application tries to load the DLL file, it will look at the directory which the application loaded. And it will find the malicious copy of DLL, and load it. So, our malicious code will be executed with higher privileges. As you can see, if we are using low-priv shell we cannot see the details about processes which running with higher privileges, such as user, path, architecture. But we can understand which processes running with higher privileges than ours. If one of these processes have some weaknesses we can exploit it to escalate our privileges. When we examine it a little bit, we will realize that it tries to load a DLL named hijackable.dll. 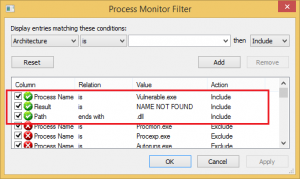 The easiest way to detect DLL hijacking vulnerability is using Procmon tool. As shown above, Windows attempts to locate the hijackable.dll by searching a well-defined set of directories. The next step is checking possible weak folder permissions. I usually check if a software gets installed in the root directory such as Python. Because if a folder created in the root directory, it is writable for all authenticated users by default. And softwares like Python, Ruby, Perl etc. usually added to PATH variable. Remember, Windows checks the directories that are listed in the PATH environment variable! BINGO! 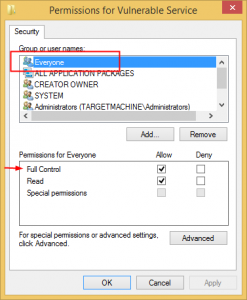 Authenticated users have modification permissions! [-] stdapi_sys_process_kill: Operation failed: Access is denied. We are unlucky today, not even killed. Anyway, we can try restarting the machine. If the “Vulnerable.exe” is a startup application, a service, or a scheduled task it will be launched again. At worst, we will wait for someone to run it. It will list the updates that are installed on the machine.